Alina, age 15, attends one of the onsite grief support groups provided free-of-charge by The Elizabeth Hospice in 17 school districts throughout San Diego County and Southwest Riverside County. Her dad died by suicide. 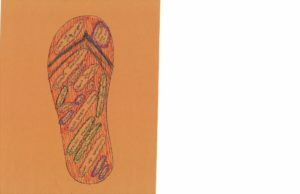 Here’s what Alina wrote after participating in the Walking in My Grief-Filled Shoes activity. “This activity meant a lot to me because it allowed me to illustrate what a day in my life is like through grief. Copyright © 2018 The Elizabeth Hospice. All rights reserved.